The fifth Jeju Peace Forum kicked off Aug. 11 in Jungmun with an international cast of participants, including United Nations Secretary General Ban Ki-moon. The event included a multitude of concurrent and plenary sessions, highlighted by keynote speeches by South Korean Prime Minister Han Seung-soo and Ban Ki-moon. South Korean Prime Minister Han Seung-soo hoped the forum would be "another leap for Jeju Island in becoming a center and a catalyst for world peace and East Asia's common vision"
Prime Minister Han was scheduled to lead the opening ceremonies of the forum, but his flight was delayed due to weather conditions. He did deliver his keynote speech later that afternoon. He opened with remarks about Jeju's pivotal role in international peace and cooperation. 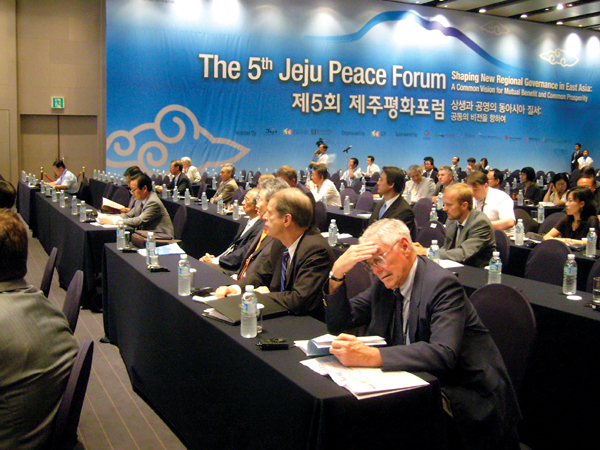 "Jeju is rather an extraordinary place to speak and think about peace . . . It is a place where people and pundits gather to pursue a cultural, social and political system which encompasses ideas and policies that lead to the practice of an active peace," he said. He referenced Jeju's role as host of several significant summit meetings, including, "some that even changed the course of history," such as the Summit of Korea-Soviet Union in 1991 and this past June's first ROK-ASEAN Commemorative Summit. Prime Minister Han spoke of many serious global threats, such as "international terrorism, climate change, the proliferation of WMD, and pandemic diseases." "We now live in a world that has become increasingly interconnected and interdependent . . . to understand and address the challenges of the twenty-first century, we have to think and act together," he said. Looking to such systems as the G20 Summits for constructive collaboration, he emphasized the need for a global effort to counteract these problems. With East Asia now taking an even greater role in the global scene, the ASEAN-Plus-3, East Asia Summit, the ASEAN Region Forum and the Korea-Japan-China Summit are part of a meaningful effort to help create a shared vision of a "peaceful East Asia" for the future. Sharing his thoughts on what this vision entails, Prime Minister Han said, "Collective wisdom and pressure are necessary to deal with North Korea and solve the security threat it presents to the Korean peninsula, East Asia and the world as a whole." Also equally important was the need to address climate change, remarking that, "sustainable development and green growth constitute vital elements in the vision for the future of East Asia and the world," which parallels President Lee Myung-bak's proclamation on the 60th anniversary of the founding of the ROK in 2008, stating "Low Carbon, Green Growth" as Korea's new national vision. "Korea's success story is extraordinary and unparalleled in world history," Prime Minister Han said, speaking of Korea's seismic shift from one the world's poorest countries to the world’s fourteenth largest economy. Looking to Korea to lead by example, he spoke (spacing) of its contributions to East Asia and the rest of the international community as well as its plans to carry out the "green growth" policy, citing the need for more concrete action and participation to reinforce multilateral cooperation within the region. Thursday Aug. 13th morning participants gathered in the Grand Ballroom of the Haevichi Hotel and Resort to hear UN Secretary General Ban Ki-moon's keynote address. Every precaution was taken by his security detail to ensure his safety during his speech on the final day of the forum in front of a packed auditorium. Secretary General Ban Ki-moon opened with a few words about his personal experience with the forum, "This forum holds a very special place in my heart . . . I was personally involved in its launch … [and] in the creation of the Jeju Peace Institute," he said. He also discussed how it has helped to put Korea in a critical "bridge-building role" within the region and around the world. "We meet at a moment of profound opportunity and challenge for multilateralism … we confront global crises the likes of which we have not seen in generations," he said. He stressed that leaders must summon the political will that this moment requires in order to achieve a “concrete multilateralism” focused on results and a “pragmatic multilateralism” that brings real change into people's lives. The success of which, he stated, rests upon the cooperation and recognition of the world's interdependence, adding that Asia is vital in shaping this new world, but that it needs to foster a closer relationship among Asian nations. He noted the common ground that all Asians share despite differences, including a common history, values and traditions. Secretary General Ban Ki-moon proposed concentration upon three common pillars, security, economic and environmental, in striving to build a new multilateralism within East Asia. The first, recognizing that the ASEAN Regional Forum is a good start, but that a much more complete framework is needed. Speaking of the six-party process, and the potential it holds in the long term, he stated that it could "evolve into a broader framework for the kind of multilateral security cooperation the region needs." In the economic pillar, he welcomed the idea of creating an Asian Monetary Fund (AMF) that would work with the International Monetary Fund (IMF) and help to combat financial and economic epidemics across the globe. Ban Ki-moon emphasized a more regional approach to trade and financial dependence, in order to reach a more economically integrated East Asia, and addressed the issue of global warming. "It is clear that climate change respects no borders and needs no visa … we have reached a pivotal moment — the world has a chance to seal a deal on a climate change agreement that all nations can embrace," Ban Ki-moon said of the environment and looked to China as one of the countries that needs to take a "special responsibility" and take charge in the global fight against climate change. 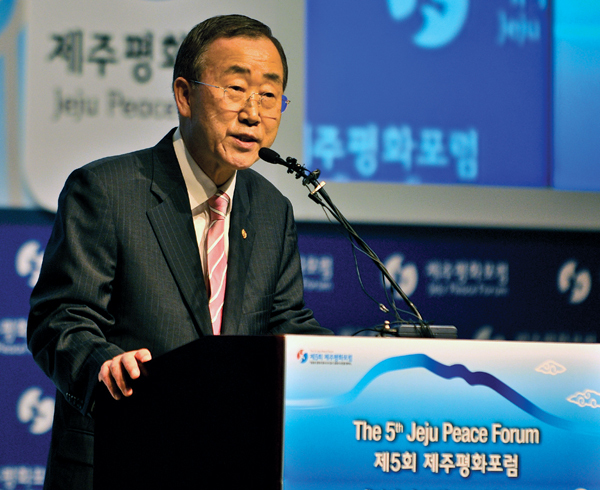 Similar to an idea proposed by Prime Minister Han, Ban Ki-moon cited that South Korea should be used as a model for others still in transition to democracy and advanced economy.